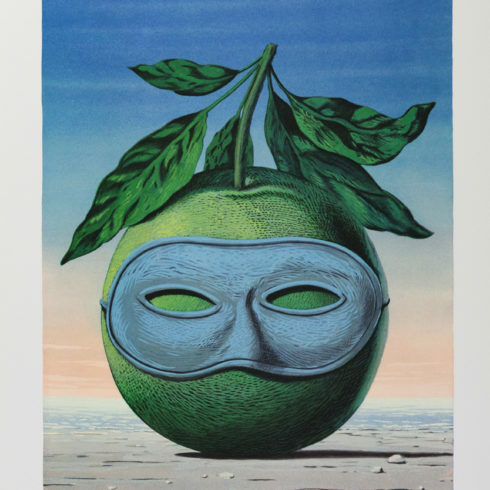 Rene Magritte was a Belgian surrealist artist who often depicted ordinary objects in an unusual context. His work is known for challenging observers’ preconditioned perceptions of reality. 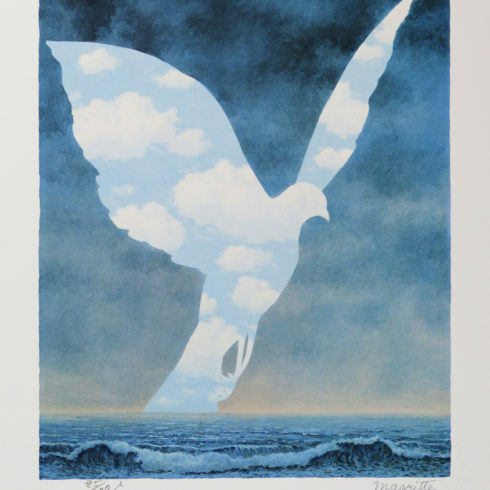 Surely the most celebrated Belgian artist of the 20th century, Rene Magritte has achieved great popular acclaim for his idiosyncratic approach to Surrealism. To support himself he spent many years working as a commercial artist, producing advertising and book designs, and this most likely shaped his fine art, which often has the abbreviated impact of an advertisement. While some French Surrealists led ostentatious lives, Magritte preferred the quiet anonymity of a middle-class existence, a life symbolized by the bowler-hatted men that often populate his pictures. 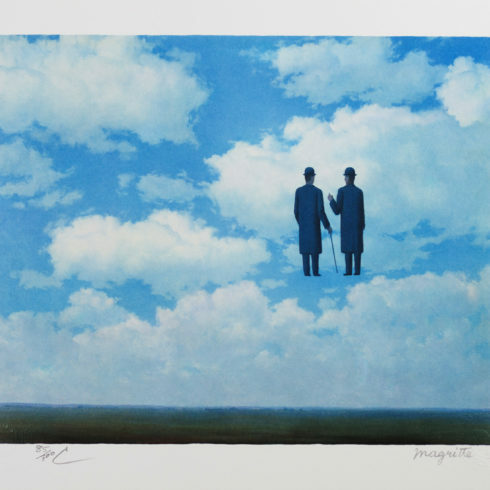 Denis Bloch Fine Art has original Rene Magritte prints, lithographs, etching, aquatints and posters for sale. We encourage you to make an appointment to see specific works you are looking to collect. We are happy to meet you at either our art gallery showroom or at your home or office for a private presentation. 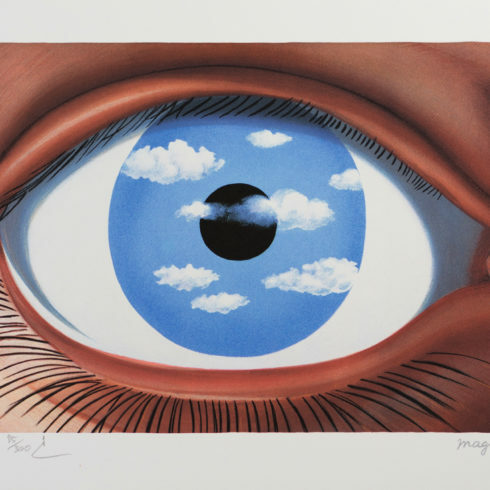 Surrealist Artist Rene Magritte is known for his witty and thought-provoking paintings, prints, and sculptures. 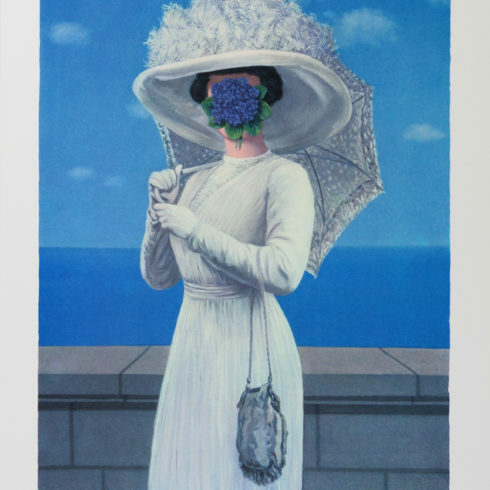 Rene Magritte is considered one of the master artists of the 20th Century, and his artworks went on to influence both Pop Art and Minimalist Art movements. 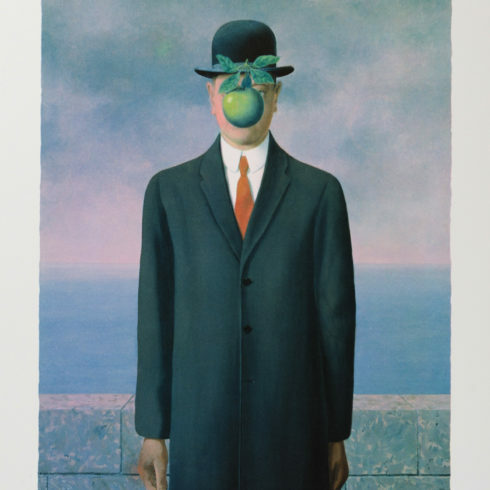 Belgian surrealist artist, Rene François Ghislain Magritte, was born November 21st, 1898. 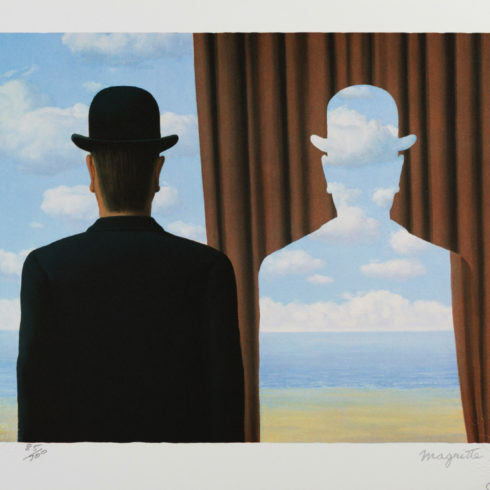 Rene Magritte’s father raised him alone after his mother committed suicide in 1912. Magritte’s artistic pursuits began early in life when he started drawing classes in 1910 and soon decided to study art at the Academie des Beaux-Art in Brussels. After two fruitless years at the academy, Magritte experimented with futurism and figurative cubism-inspired by Picasso and Metzinger; focusing primarily on nudes. René Magritte married his wife Georgette Berger in 1922. 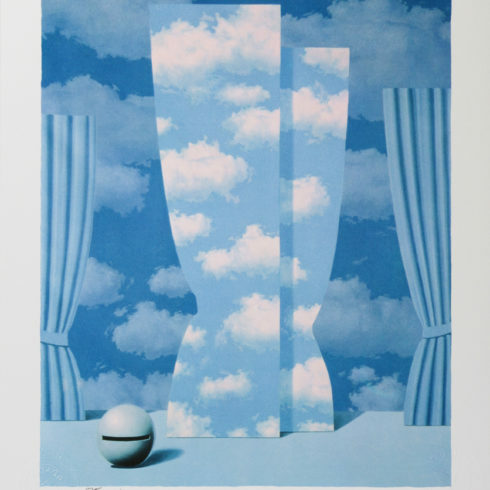 Between the years 1922-1926, Magritte held a number of odd jobs, including painting for a wallpaper manufacturer and designing poster advertisements. During this period Magritte discovered that surrealism was the art form he enjoyed the most, and one of his first known surrealist artworks was painted in 1925, titled The Lost Jockey. 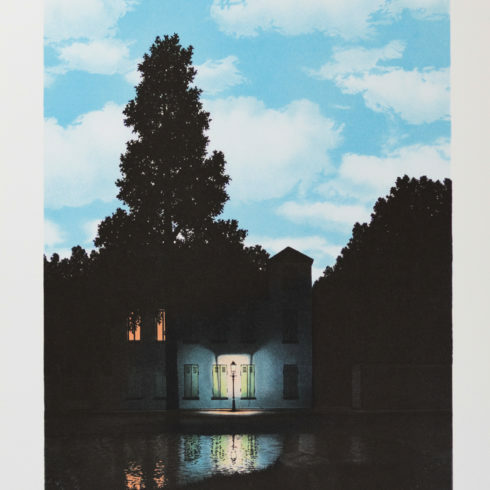 Magritte was given his first opportunity to become a full-time painter in 1926 when he signed a contract with art gallery Galerie ‘Le Centaure’ in Brussels, which also hosted his first art exhibition. 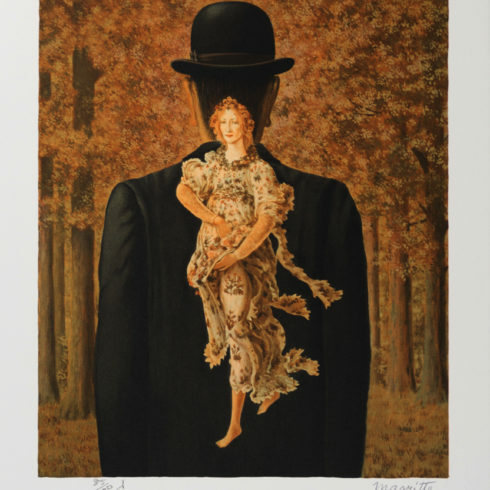 After an unsuccessful, first one-man show in 1926, Rene Magritte moved to Paris where he would meet fellow surrealist artists like Andre Breton and would join his surrealist group. After his return to surrealism, Magritte very rarely strayed away from the form, and most of his artworks depict reoccurring themes and scenes. 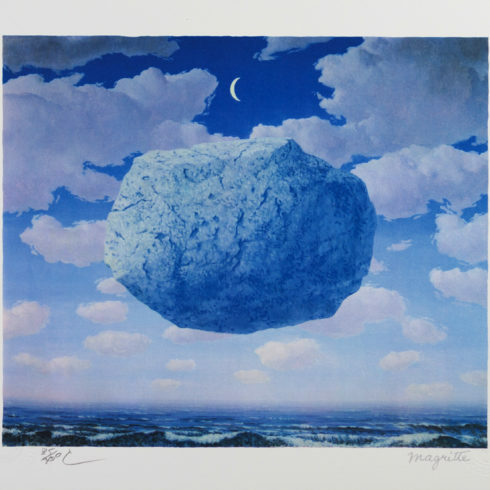 Many of his favorites like floating rocks, or a painting within a painting, highlight Magritte’s playful and provocative sense of humor. 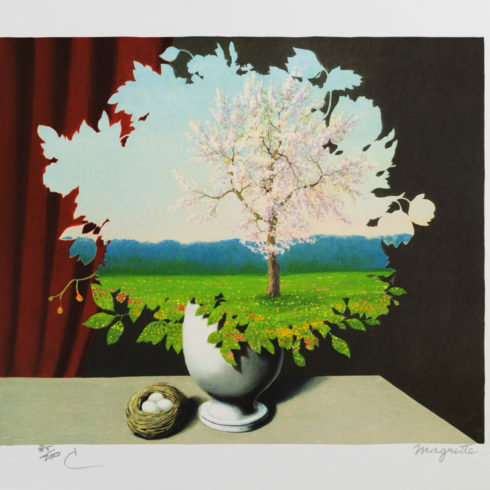 Rene Magritte’s prints and sculptures were created within the last eight years of his life. 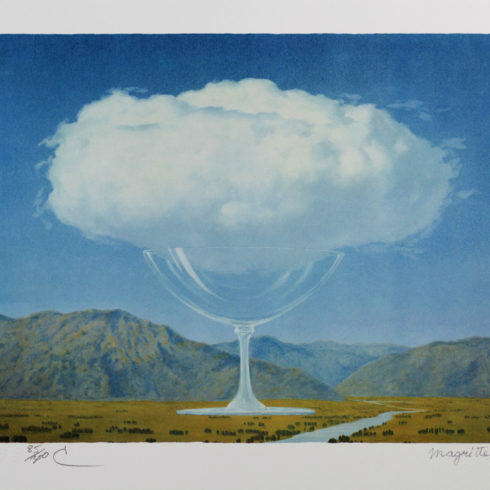 Although his original prints were few in number, they are still an important part of his oeuvre. 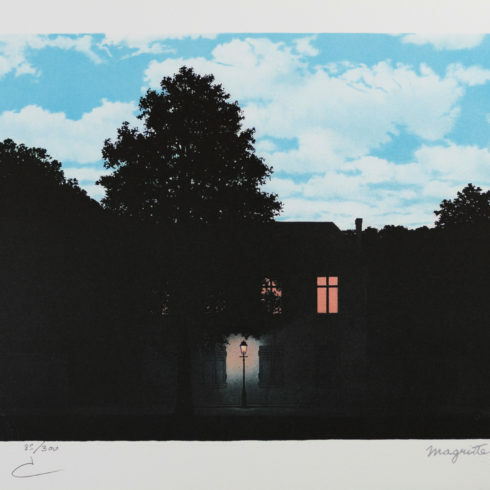 Rene Magritte’s fine art prints represent a very significant part of his life, a time in which he strived to create a large amount of art in a short period. He continued creating art until his death in 1967 of pancreatic cancer. 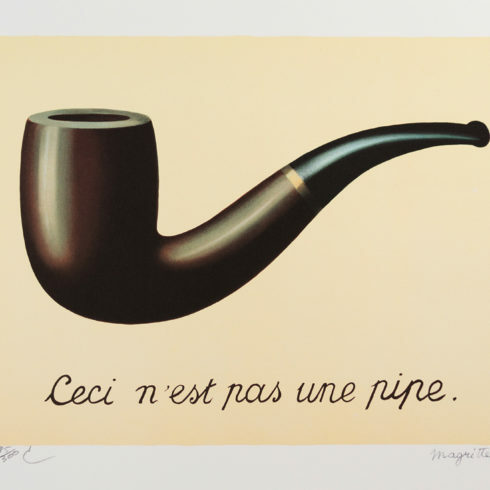 Rene Magritte’s art has been shown in Brussels and in museums all over the world. 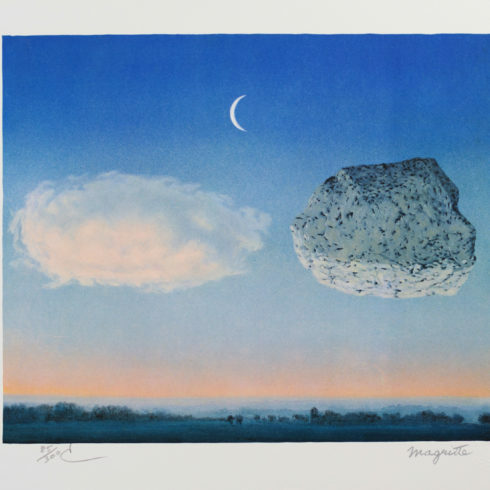 New York City has exhibited Magritte’s artworks several times, once in 1936 at the height of his career, as well as two retrospective exhibits, one in 1965, two years prior to his death, at the Museum of Modern Art, and also much later in 1992, at the Metropolitan Museum of Art.